^ a b c The relation between nationality, genetic ethnicity, native and mainly spoken language(s) (within a group of same ethnicity and age, in presence of elders, in ethnically mixed groups), and minority group identification, can be complex: Dutch nationals constituting one of the largest groups of foreigners, share the standard language with Flemish locals but their accent is enough to immediately distinguish them. The majority of immigrants from certain other countries, had belonged to a minority or disadvantaged group there. Children born in Belgium from residents of foreign nationality, very often acquired Belgian citizenship. Regardless of nationality, according to Belgian Law, obligatory education in schools located in the Flemish Region are in Dutch language. In Brussels, teaching is also done in French. The determination of statistical samples and interpretation of publicized figures can easily lead to false assumptions or conclusions. ^ a b c "Antwerp – History". Find it in Flanders. Tourism Flanders & Brussels, Flanders House, London, UK. Retrieved 2 January 2007. ^ "Kingdom of Belgium map (politically outdated)". Planet Ware. Retrieved 15 May 2007. ^ Leclerc, Jacques (TLFQ member) (16 June 2011). "Histoire de la Belgique et ses conséquences linguistiques". L'aménagement linguistique dans le monde (in French). Trésor de la langue française au Québec (TLFQ), Département de Langues, linguistique et traduction, Faculté des Lettres, Laval University, Quebec, Canada. Retrieved 21 July 2011. Et pour les Flamands, la même chose! Meylaerts, Reine (KUL). ""Et pour les Flamands, la même chose" : quelle politique de traduction pour quelles minorités linguistiques ?" (Pdf). journal des traducteurs (Translators' Journal), vol. 54, n° 1, 2009, p. 7-21 (in French). Consortium Érudit 2011, Quebec, Canada. Retrieved 21 July 2011. ^ Peter De Lobel (25 January 2016). "Staatshervorming richting België wint aan politieke steun" [State reform towards Belgium is gaining political support]. De Standaard (in Dutch). ^ "The Communities". .be Portal. Belgian Federal Government. Archived from the original on 30 September 2007. Retrieved 23 May 2007. ^ "The Regions". .be Portal. Belgian Federal Government. Archived from the original on 30 September 2007. Retrieved 23 May 2007. ^ "Drie op vier Vlamingen zijn trotse Belgen". knack.be. ^ "Handvest voor Vlaanderen" (pdf). vlaamsparlement.be. ^ Myriam Dumortier; Luc De Bruyn; Maarten Hens; Johan Peymen; Anik Schneiders; Toon Van Daele; Wouter Van Reeth; Gisèle Weyembergh; Eckhart Kuijken (2006). Biodiversity Indicators 2006 – State of Nature in Flanders (Belgium) (PDF). Research Institute for Nature and Forest (INBO), Brussels. ISBN 90-403-0251-0. Archived from the original (PDF) on 14 June 2007. Retrieved 15 May 2007. The altitude ranges from a few meters above sea-level in the Polders to 288 m (945 ft) above sea-level in the south eastern exclave. ^ "Flanders: export-driven economy". Archived from the original on 24 February 2017. Retrieved 26 January 2017. ^ "Focus on the port". 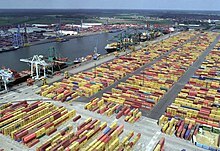 Port of Antwerp. Archived from the original on 28 August 2008. Retrieved 27 September 2009. ^ "Statistics Belgium". Federal Public Service Economy. ^ "Belgium". International Religious Freedom Report 2004. US Department of State, Bureau of Democracy, Human Rights, and Labor. 2004. Retrieved 28 May 2007. ^ "Education in Flanders" (PDF). A broad view of the Flemish educational landscape. 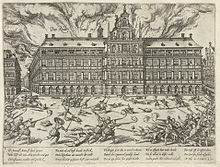 Ministry of the Flemish Community. 2005. Retrieved 2 November 2009. ^ "De Taalunie – Wie zijn wij?" (in Dutch). Nederlandse Taalunie. Retrieved 19 February 2011. ^ "De Taalunie – Werkwijze en beleid" (in Dutch). Nederlandse Taalunie. Retrieved 17 February 2011. ^ Hoeksema, Jack. "College 4 – 1830 Belgische onafhankelijkheid, Noord-Zuidverschillen, Dialecten en de rijksgrens, Frans-Vlaanderen" (ppt) (in Dutch). University of Groningen (host site). Retrieved 19 February 2011. ^ "Hendrik Conscience (biography)" (in Dutch). Letterkundig Museum, The Hague, The Netherlands. Archived from the original on 24 July 2011. Retrieved 21 February 2011. ^ Couttenier, Piet (1999). "Nationale beelden in de Vlaamse literatuur van de negentiende eeuw". 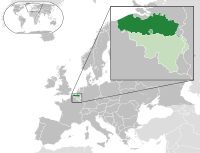 Nationalisme in België. Identiteiten in beweging 1780–2000. (Deprez, Kas; Vos, Louis – red.) (in Dutch). Houtekiet, Antwerpen/Baarn (online by dbnl). pp. 60–69. Retrieved 21 February 2011. ^ Gezelle, Guido. "Driemaal XXXIII Kleengedichtjes – Gij zegt dat 't vlaamsch te niet zal gaan" [Three times XXXIII Little Poems – Thou sayst Flemish will fade away] (PDF). Dichtwerken (deel 1 en 2) [Poems (Part 1 and 2)] (ed. Baur, Frank) (in Dutch). Veen, Amsterdam (1949, 3rd print – online by dbnl). Part 2, p. 505. Retrieved 19 February 2011. ^ a b de Ridder, Matthijs (doctoral candidate University of Antwerp) (22 May 2009). "Inleiding tot een proefschrift over de activistische tegentraditie in de Vlaamse letteren ('Introduction to a dissertation on the activist tradition in Flemish literature') (descriptive title)" (in Dutch). Mededelingen van het Centrum voor Documentatie & Reëvaluatie (a republishing Blog about French and Dutch Literature). Retrieved 21 February 2011. ^ Polis, Harold (ed. red. at Meulenhoff/Manteau) (25 June 2004). "Vlamingen en Nederlanders moeten hun verschillen leren aanvaarden". Taalschrift (in Dutch). Nederlandse Taalunie (Ed. 77). ISSN 1570-5560. Retrieved 21 February 2011. ^ "Flanders (Belgium)" (PDF). Frankfurter Buchmesse. ^ Mick Van Loon (28 October 2014). "Examens Frans, Engels en Duits moeten moeilijker worden volgens minister Crevits. Raar, want er is geen problem" [Exams for French, English and German must become more difficult according to Minister Crevits. Weird, because there is no problem] (in Dutch). ^ George Wingfield (2008). Charles F. Gritzner (ed.). Belgium. Infobase Publishing. pp. 94–95. ISBN 978-0-7910-9670-3.